This is my solution. 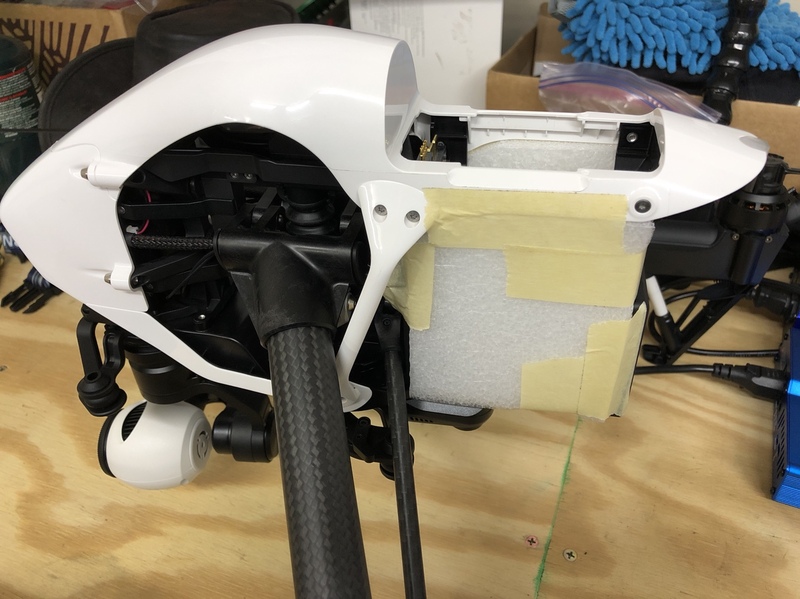 Cut from a small sheet of 4mm wetsuit neoprene using cardboard templates, stitched and glued with neoprene adhesive and tape under the battery, and with velco strips sew on the forward edge. Looks good! Keep an eye on temp while you get used to the new blanket. Each set of materials have their own insulating characteristics so you'll want to know what the appropriate ambient temp range is to put this on. Letting battery temp get too hot can be as bad as too cold. Goldilocks zone, etc. Very good point. With an ambient air temperature of 4C, the TB47 batteries got to 44C and 43.5C after one 2 takeoff/landing 8 min and one short 5 min test flights. The temperatures were still raising steadily. I currently am having two of these made. Due to having the left over fabric I am having more made. I am having them made with pockets that will fit a toe warmer like Damon showed. I figure if someone wanted one and did not wish to have one made i would have a few extras. They should be done this weekend and i will post what they look like in a day or two. That's great - nice job! Why do you keep your TB48 warm and cozy and the 2 others not? Degrees what? C or F. I assume the latter but not everyone uses it. The US is in the minority. Good report thank you. If the aux are higher C rated (25C+) they are less critical than the DJI main battery to keep in the Goldilocks zone as there's less chance of a voltage sag that will tax the batteries due to temp. If your aux are also low C (10C), it would be recommended to keep a jacket on them as well in very cold temps. But with 3 batteries shouldering the load there's still some margin for error. Super critical is keeping the DJI battery in the zone when not using any aux batteries as the strain on the DJI battery is highest when it's alone and because of it's low C rating the margin of error is much smaller should a voltage sag occur. That's what i figured as well. My side saddle batteries are 35C discharge. But this flight was mainly for the X5 work around adapter, and the in flight battery warmer. I just needed to discharge the two extra batteries for storage so they went along for the ride. As for the numbers...28 degrees Fahrenheit outside. I have test my inflight battery warmer just right now. In the same conditions i have up to 5 degrees celsius more with the cover. Just offering something i knew about in another field. I have that exact closed cell phone left over from a mail package and was thinking of the very same but with some gorilla tape or some Velcro. Unlike the lower 48 my spring time temps are still pretty cold so i may have to use a long term solution. As a model builder I collected different types of carbon fiber sheets, hard pressed sheets like for aircraft bulkheads. Strong and light. So my Inspire is in the mail right now, I'll post what i make up. I kinda like that 3D printed battery cover. I almost forgot my sons birthday was today so i gave him my old Skyviper 2450FPV drone. Like the ideas and mini Temp Reader in above pics. Could you provide a URL Link or brand/model for the mini Temp Reader. I'm a Newbie to the site, could you provide the URL, Title or date range that discusses your saddle batteries and modified wire connectors visible in photos.